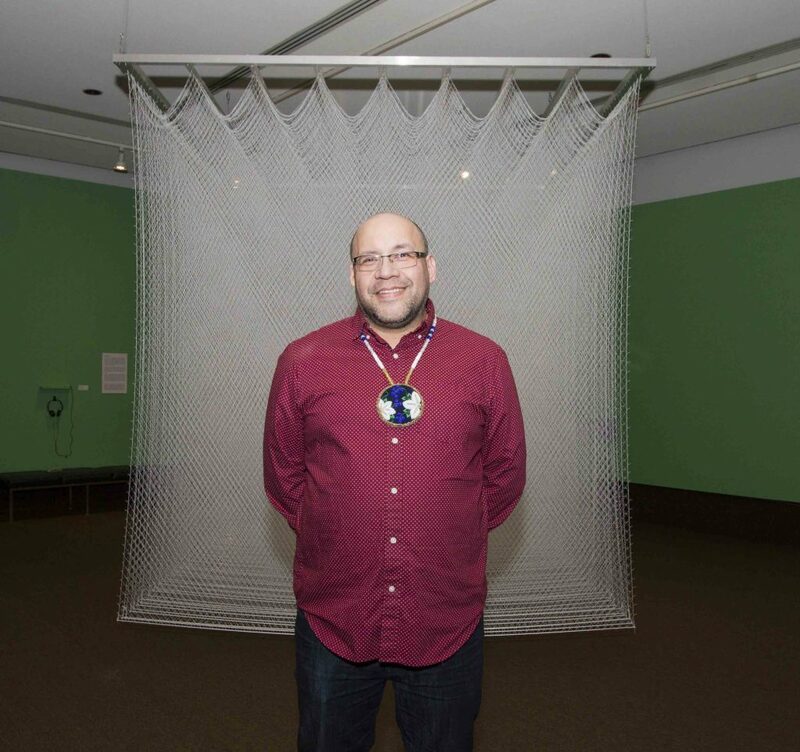 Artist Frank Shebageget in front of his work Cell, 2010, aluminum, nylon fishing net, steel fishing hooks, string, airline cable, 100 × 100 × 100 in. The Thunder Bay Art Gallery is proud to officially announce the acquisition of Cell by Frank Shebageget, made possible by the 2018 York Wilson Endowment Award, which is administered by the Canada Council for the Arts. Made of nylon fishing nets, steel hooks, aluminum angles, and rods, this minimalist work evokes the luminous underwater world of fish and the act of fishing. For Shebageget, the work also recalls his childhood growing up in Upsala, a small, unincorporated community 144 km north of Thunder Bay. There he would spend hours alongside his siblings in his family home untangling fishing nets for his father. Currently based in Ottawa, Shebageget continues to draw inspiration from the culture and history of Northwestern Ontario. The installation specifically speaks to the regional history while also emphasizing innovative ways of articulating it. Cell uses standard fishing materials and transforms them into an awe-inspiring work of contemporary art.